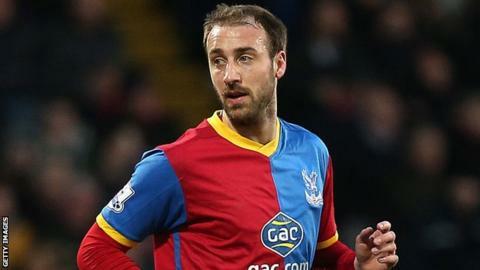 Crystal Palace striker Glenn Murray expects to improve further after coming back from a nine-month injury lay-off. The 30-year-old returned to action in February and has scored one goal in seven appearances this season. He told BBC London 94.9: "It took a while obviously. When I first came back I was running on adrenaline a bit. "I kept up my rehab away from training with the first team. I am starting to feel really good now and feel as if I am getting back to it." Murray scored 30 league goals last season but ruptured his anterior cruciate ligament in Palace's Championship play-off semi-final first leg against Brighton last May. He made his return as a substitute in the 3-1 win over West Brom on 8 February and has since made three starts for the Eagles. His only goal came from the penalty spot against Swansea, where he salvaged a 1-1 draw. The former Rochdale and Brighton man was forced to watch from the stands as Crystal Palace won promotion at Wembley last May but says he is glad he has got the opportunity to play in the top flight. "The so-called lucky thing about it was the fact I did it at the end of last season," he said. "If I had done it at the start of this season then I probably would not have kicked a ball in the Premier League. "In a round-about way, even though I missed the play-off final, it was a blessing. It was a blow to miss the final but we did what we needed to do, won that and got to the Premier League. "It wasn't all bad news." Crystal Palace were in the relegation zone when former Stoke manager Tony Pulis took over from Ian Holloway as manager in November, but the south London side are now five points above the bottom three. Murray hopes to make a big impression next season should Pulis lead the side to survival. "The boys have done a fantastic job and to be in the position we are in now has given ourselves a fighting chance [of staying up]," Murray said. "Tony Pulis has brought Premier League experience and know-how and has got us a lot more organised. You can tell that from the way we are playing and the way we have done under him. "I don't think anyone expected the win over Chelsea [last week] and it has given us a huge boost. "It would be nice to get the opportunity to score some more goals. Hopefully we will stay up and next year I can have a go at it fully fit."